May be used for a wide variety of crop pests. 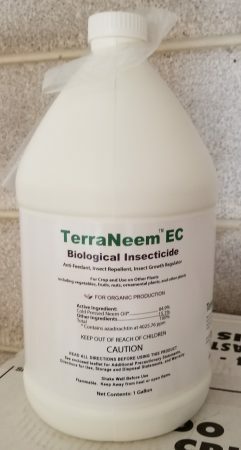 Minimally processed Terramera Neem EC has broad range of insecticidal, anti-feedant and antifungal properties, especially when used with other natural products such as Karanja Oil and Garlic Oil. There is no significant, documented harm to beneficial insects when used at rates of 1/4 to 1/2 per cent of total spray tank mix (see notes*). Pre-emulsified cold-pressed Terramera Neem Oil is ready to mix with water. Use warm water for premixing (above 75F). Use with other natural penetrants and insecticides to increase effectiveness and absorption into the plant. *Minimally processed neem oil mainly works as an insecticide by interfering with the normal growth of insects that ingest the product through feeding on plants. Since beneficials do not feed on plants they are not affected in the same way as plants pests..